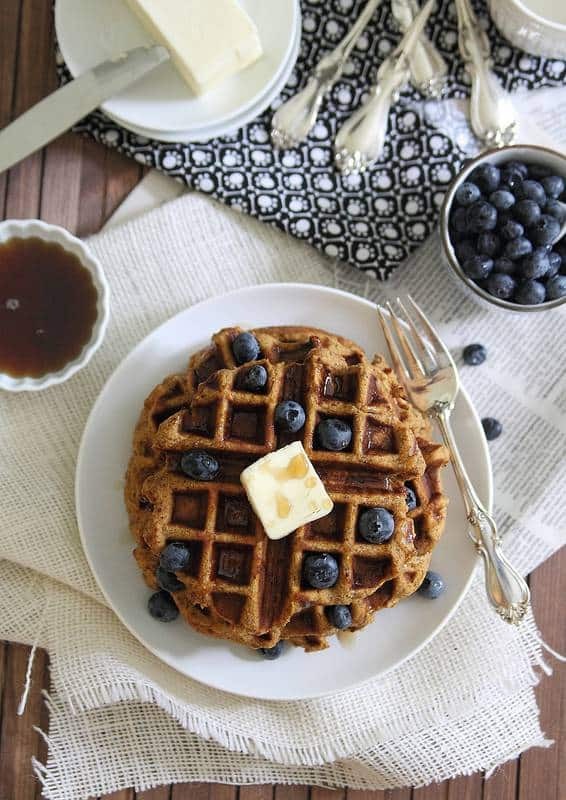 Start your morning with these paleo and gluten-free sweet potato waffles. Filled with fall/winter spices they’re a hearty breakfast you’ll love. *This post was originally published 9/18/2013. Pictures below are original, the text has been updated as of 1/21/2018 and there’s now a video included on how to make these Sweet Potato Waffles. Scroll down to watch! In updating this sweet potato waffle recipe to include a video, I felt compelled to update the text of this post too, something I don’t usually do because it just tends to feel “wrong” and because I think it’s hysterical to go back and read my own ridiculousness years later. It’s been 4.5 years since this was originally posted though and not only was the entire post about the selling of our house (which actually never ended up panning out) but this recipe has since gotten a fair share of criticism (see the comments below) which I feel like we need to talk about. In fact, a more recent comment on this post is what actually inspired me to make a video showing you how to make these sweet potato waffles. I woke up one weekend morning to someone basically telling me I ruined their life (ok, not really but it was one of the more dramatic comments down below) because these didn’t turn out at all for them. Basically, I was second guessing myself. Especially since it’s a paleo recipe and those can be finicky some times. So, I whipped out all the ingredients doubting myself every step of the way and about 15-20 minutes later I nervously opened the waffle iron after hearing that beep and you know what I found? A perfect effing sweet potato waffle that looks exactly like the ones you see in the pictures above or the video below. They’re hearty, wholesome (paleo and gluten-free too), bursting with warm fall flavors of cinnamon and fresh nutmeg and really, all they need is a little drizzle of maple syrup to be breakfast ready. So, listen all you commenters – I truly don’t know what you’re doing wrong if these aren’t working out for you. There’s only so many times I can say “did you spray/grease your waffle iron adequately?” or, “are you sure you followed the recipe/directions exactly?” before I start to lose my cool. This recipe works, it has never failed me and it’s delicious AF. Don’t believe me? Watch the video in this post. No magic tricks – that’s me making it for you IN FRONT OF A CAMERA start to finish with zero issues. Here’s to a big stack of waffles on your breakfast plate. 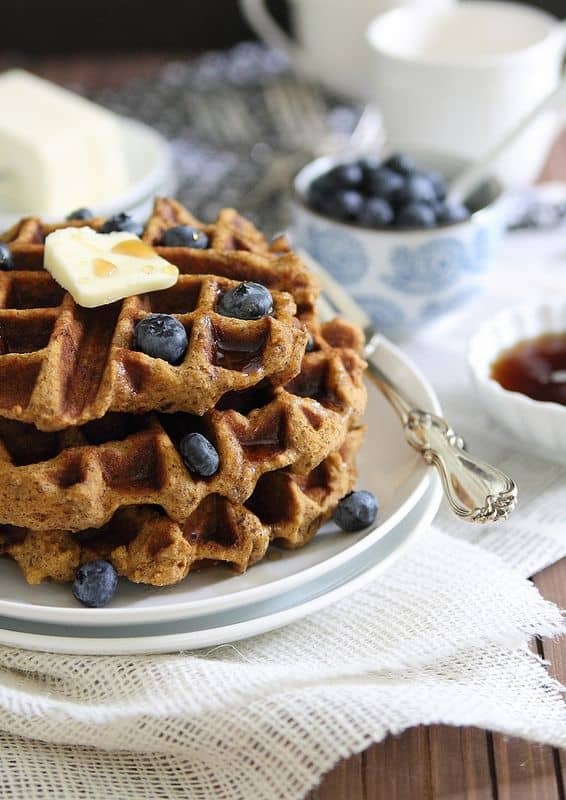 Start your morning with these paleo and gluten-free sweet potato waffles. Filled with fall/winter spices they're a hearty breakfast you'll love. yum! I love anything sweet potato but I haven’t had it in my breakfast yet– this is a must try! You know what I love best about this? No tapioca or potato starch…it seems like most gf recipes I come across call for one or both of those ingredients and I would rather eat flour and deal with the consequences than use either of those ingredients in my recipes. Thanks for a great waffle recipe! Congrats on selling your house, and my condolences are with you regarding the downsized kitchen. What a tragedy!!! These waffles look great – I wish I had almond flour so I could make them for breakfast this morning. I totally woke up in a waffle mood. These look absolutely delicious! A must try for me and the kids! We just moved across the state of Texas. It can become stressful especially when you pack up all your kitchen goods but you need something for dinner. I can’t wait to see what yall do. Congrats on selling your house! I actually kinda like moving. Not the packing, unpacking, and cleaning; but the house hunt and the decorating. I hope you have room for the waffle maker cuz these waffles are the bomb…mmm mmm mmm sweet potatoes and maple syrup! Congrats on the sale of your house and good luck with the move and finding your perfect home. These waffles have me drooling. Yum, yum, yum!! These look amazing. Perfect for freezing and I’m always looking for something healthy to feed the kiddos in the morning. I swear sweet potatoes are magic! this looks like the perfect fall recipe! will definitely be giving it a try. Oh, hello lover! Mmmm…I am definitely on team waffle and these looks delish! Wow! You are so lucky! My husband & I always comment on how smoothly real estate transactions go on tv vs. the real life. But y’all lucked out! I think it means it’s meant to be. We just found out we’re moving again, and now we have to sell the first house we ever bought together. Le sigh. But, we’re unattached because if it won’t sell, our company will buy it from us at market value. Not the best deal, but at least it’s something to rest on. What a stressful time! Downgrading a kitchen is never a good thing! Best of luck in the move and I hope you can find space for the waffle maker because these look amazing! Yum! I’ve got some leftover pumpkin puree that might work in this recipe. Any idea what a medium sweet potato equals in cup measurements? These look so good, Gina! I would love to wake up to a huge plate of them. I love sweet potatoes. Thank you for sharing – I can’t wait to make them. These look delicious!! I can’t wait to try them. Thank you for sharing! Congrats on selling your house and best of luck on your new journey! Pingback: Stumbling Over Chaos :: Does linkity really even need a title? Congratulations on selling your house! My last transaction, when I sold my condo after I got married went about that smoothly. I’m glad yours did, because they can be a real hassle at times. This waffle recipe looks that good! I would have to cook them as pancakes (I hope that would work) because I don’t have a waffle iron and have no intention of getting one, for many reasons, not the least of which is storage space. I’m looking forward to trying them. I am writing a story for a local women’s magazine here in Florida called Bella. My objective is to introduce our readers to the Paleo Diet and I wanted to provide an example of a sweet treat. This clearly fits the bill and looks amazing! May we use this photo in our article with credit to your website? Hi Heather- thanks for reaching out! Yes, you can use the photo with credit. Please do not replicate the recipe in it’s entirety however. Thanks! Yikes! Good luck with your move! I would be nuts with such a big change so quickly. These waffles are absolutely gorgeous. Your photos are so inspiring. Beautiful job! Just curious if anyone has actually made this. I tried it this morning and they fell apart miserably. Had to abandon ship and use another waffle recipe because these fell apart so much I could get them out of the iron without a scrub brush. Any tips? Hi Nicole- sorry you had trouble with the recipe. Did you make any substitutions or follow it as written? I’ve made these so many times (again last week actually) and never had an issue with them falling apart. Did you grease your waffle iron? Yes, the coconut oil should be melted and the sweet potato pretty smooth, I didn’t use a food processor but there shouldn’t be any chunks or anything. Are you using a regular waffle maker or belgian? Gina!! I am looking into buying a waffle maker and am pretty lost about it. I saw your recipe and wonder which waffle maker do you use? do your waffles stick to the waffle maker? I’ve been reading reviews about a few of them, but none of them seem to quite function perfect or they take a process (like even throwing away the first waffle) in order to get to the perfectly-cooked waffle. HELP! lol. Graciaass! This is the one I have: http://amzn.to/2lq73RK My husband got it at BJs or Sams Club years ago, pretty sure he didn’t pay that much either (!!) I’ve never had sticking issues with it as long as I spray it before using. Throwing out the first waffle sounds horrible! You shouldn’t have to do that with any good appliance! In all my years of using it, maybe one time was a disaster but I’m pretty sure that was the recipe and not the waffle maker itself. I had the same misfortune. They fell apart as soon as I lifted the Belgian waffle handle. Maybe too much sweet potato in mine? Too starchy? AMAZING! My younger son doesn’t eat sweet potatoes, but he said he would try. He devoured them! He needs as many nutrients as he can get. Thank you SO much for this recipe. This is the first time I have rated one! I made them again to freeze. I am so frustrated, I am just trying and trying to take the waffles off my waffle maker, they stick to the sides and fell apart. The attempt to make pancakes fell as well. What did I do wrong? I followed the recipe to the t. Thanks in advance. Many calories are in each waffle? It is recommended for people with diabetes I? It says maple syrup in the wet ingredients….just want to make sure I put it in the actual batter too? Made them this morning and they are quite delicious. Thank you for the recipe. It’s a keeper. Hey everyone, if the waffle maker isn’t working, just fry it up like a pancake! Would it still work if I used regular unbleached flour and regular milk? I love the idea of sweet potato psncakes! not sure honestly, haven’t tried this recipe with those substitutions. Please let me know if you do! Hi, Gina my family went through the exact same real-estate adventure! I’m Greek-born and I was eager to try this recipe. Well, I did, and the result was delish! Thanks much. 1. Whipped the wet ingredients in a high-speed blender first to a smooth pulp. 2. Added the dry mix and whirled away. 3. Spooned batter onto a round waffle maker and voila! Yield: 3 round (8-inch) waffle sets. Poured 2 cups boiling hot water into the blender and whirled well to cook the egg in the mix leftovers. Added 2 tbs instant coffee, 2 cups cold water, and whipped everything into 1 awesome quart (4 cups) latte! Thanks again and again, Gina! I was skeptical before, during the batter & cooking process, and while serving. And my husband strongly dislikes sweet potatoes, but these are pretty darn tasty. I made these a few months back and we LOVED THEM! However…for some strange reason the last 3 TIMES I have tried making them they have stuck like crazy and not worked at all. Waaahhhhh. …so much waste!!!! I have worked with different amounts of sweet potatoe and kept everything else the same…I cannot figure it out!! Wow, these are spectacularly awful. One of the worst recipes I’ve ever made, bar none. Followed the recipe to a T and they fell apart, gummed up my waffle iron and didn’t even work as pancakes. So now I’ve got four hungry kids crying because they didn’t get waffles and a huge mess to clean up. Save yourself the frustration and pass on this recipe!! I’ve made these countless times without issue. Your comment, however, made me second guess myself as it’s been some years since I last made them so I literally took all the ingredients out and made them for breakfast just now. I had NO issues. Came out exactly like the pictures, no sticking, no falling apart. I’m not sure how or why you weren’t able to get the same results if you followed the directions. Did you grease your waffle maker? Was it preheated and hot? The exact same thing happened to me!! Tasted too salty too and i put less than it called for! Glad to hear they still work for you! I did preheat and grease the waffle iron. The only thing I can figure is that your “medium sweet potato” and mine are a totally different size. I think I’ll try this again and fiddle with it a bit when the stakes are a little lower and we aren’t eagerly looking forward to breakfast! Wow, 567 calories per serving, 38grams of fat, 42 grams of carbs and 20 grams of protein. if I were in my 20s maybe. Have to pass up this recipe. Love the warm spices i these Gina! I bet they’re delicious! 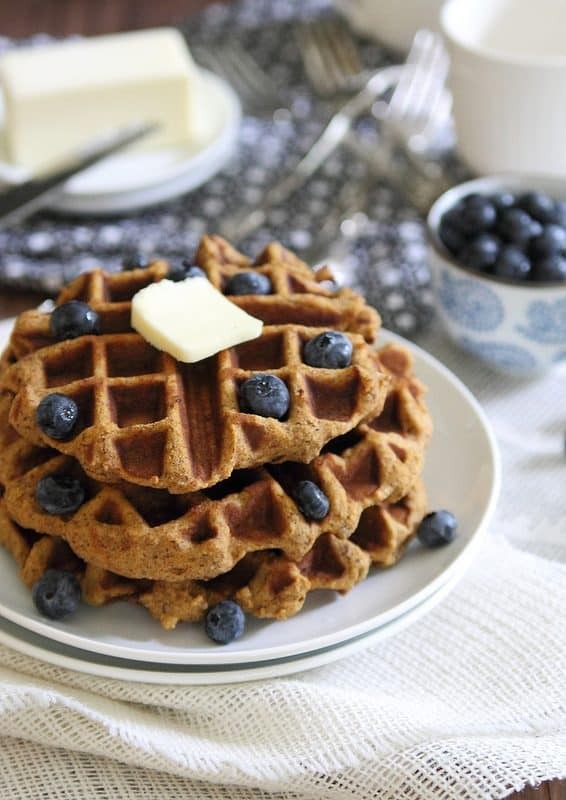 These sweet potato waffles look so delicious! They’ll be perfect for Sunday brunch! These waffles were easy to make and were delicious. Thanks for the recipe! They came out perfect each time. FYI, I came up with 2.5 – 3 grams of net carbs for each waffle. Am I close with this result? Glad you liked them! To be honest, I’ve never calculated the net carbs so I’m not sure on that. May I substitute the almond and coconut flour with oat flour? Or would that alter the texture or structure of the recipe too much? Thank you! No, those grain-free flours are not 1:1 ratios for substitutions unfortunately. You’d have to play around with it to use oat flour. I’m not sure why other readers had a problem making these waffles. I followed the recipe, except I used mashed banana, since I didn’t have any sweet potatoes on hand. The waffles were absolutely delicious. The coconut oil and maple syrup add a wonderful sweetness to the waffles, no extra syrup necessary when you sit down to enjoy these. So happy to hear it! It’s really one of my favorite recipes (especially heading into fall). How did you cook your sweet potato – boiled or baked? You can do either but I usually bake mine.